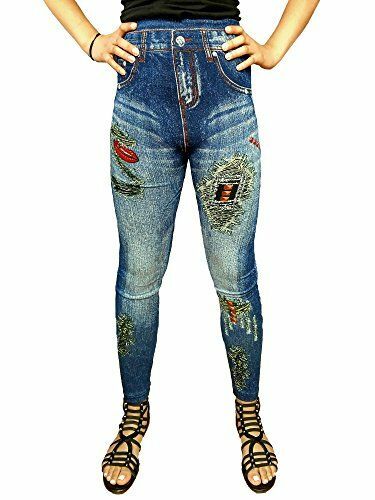 Yacht & Smith Women's Denim Jeggings Fashion Leggings One Size (Style D) at low wholesale prices. Socksinbulk.com offers Womens Leggings at bulk discounted prices. STYLE AND COMFORT: Get the look of denim with the comfort of leggings with stretchy seamless pull on jeggings. Skinny jean design looks great and flatters your curves. Stretchy fabric and elastic waistband keeps you comfortable and looking your best. Ultra- soft touch gives you all day comfort without the sagging. DISTRESSED DENIM: Get the look you want with distressed faux denim leggings. Whether you choose the ripped jeans look or a cute embroidered design, these leggings will be the perfect addition to your everyday attire. Vintage “worn in” style looks great with your favorite tee or oversized sweater. A fashion staple in your jeans collection. FLATTERING MATERIAL: .Enhance your shape with figure flattering denim leggings. Stretchy material lifts and sculpts your body for a natural curve. High waisted design smoothes away bulges and slims your tummy. Soft, breathable fabric perfect for all seasons. Designed with high quality material so you can wear them throughout the year. Skinny fit for a long and lean look.